For this month's Reading Wildly meeting, we read horse books! 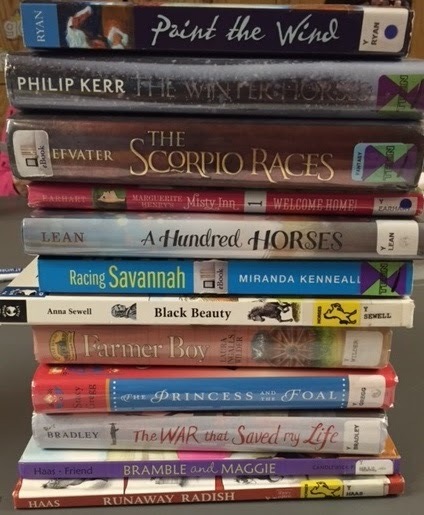 It was a great genre to explore because almost everyone (including myself) read their horse book(s) very reluctantly, which, yes, means it's a genre we need to push ourselves to pick up and explore from time to time. We kicked off our meeting with a discussion about our common text, the article "What Makes a Good Horse Book?" by Anita Burkham from The Horn Book. This article was helpful for mt staff and me because it gives some clear guidance as to what horse lovers are looking for in a good horse books. I know it helped me to pick up on these elements as I read my books. Next month, we'll be talking about fairy tale novels and reading a couple of articles about the fantasy genre: "Stepping Into the Wardrobe: A Fantasy Genre Study" by Maria Colleen Cruz and Kate B. Pollock (Language Arts, January 2004) and "Finding Fantasy: The Genre That Makes Difficult Topics Easier for Students to Discuss" by Robin Fuxa (Reading Today, October/November 2012). We'll also be choosing topics for our 2016 Reading Wildly meetings (exciting!!). We may repeat genres we have done before or add new ones. We're Youth Services now, which includes teens and expands our reader's advisory responsibilities. I'm excited to talk about the possibilities for next year! I know that in June & July we're going to do Reader's Choice and that in January we'll do kind of a variation on Reader's Choice using Becky Spratford's Staff Reader Profile that she posted on her awesome blog RA for All.